Today we add a new chapter to our 10 year anniversary series with the launch of a limited edition, hand-made varsity jacket. Our second Tenue de Nîmes club jacket was made in the local factory from Private White in Manchester, England. The jacket is made from 100% English Merino wool, has a teflon coated body and calf leather sleeves. The front of the jacket presents a special 10 year anniversary ’teddy patch’ and on the left side the team Tenue de Nîmes patch. The jacket is limited to 20 pieces only. As of today the limited edition Tenue de Nîmes Varsity Jacket is available in store and online. To Tenue de Nîmes, a varsity jacket is deeply rooted in American culture. It is one of those wardrobe classics that led a parallel life with denim. Both have deep roots in style, have long been a staple of youth culture, and have served as a symbol of independence for decades. 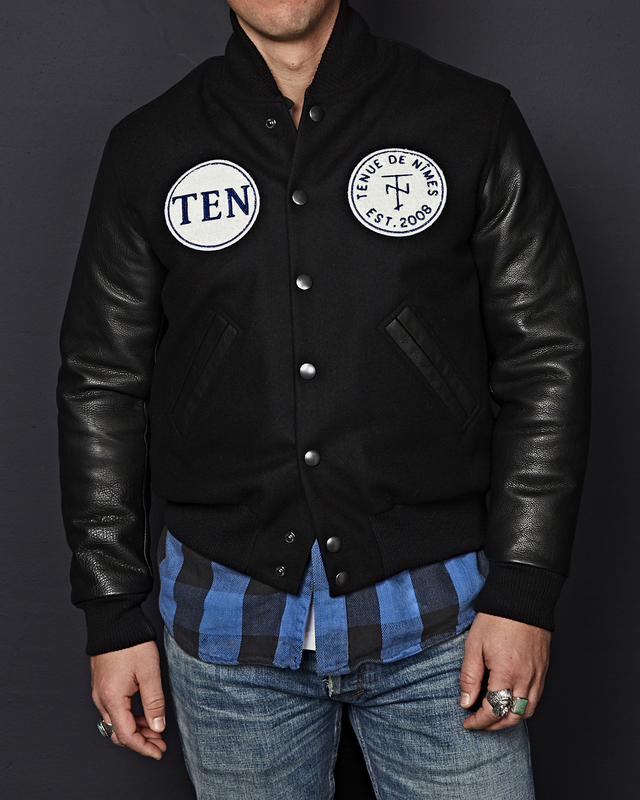 Get your Tenue de Nîmes 10 year anniversary Varsity Jacket here!